You are cordially invited to the 2019 MOGSouth Fall Meet, the weekend of September 13 -15. We have arranged with the hotel for a nightly rate of $119.00. 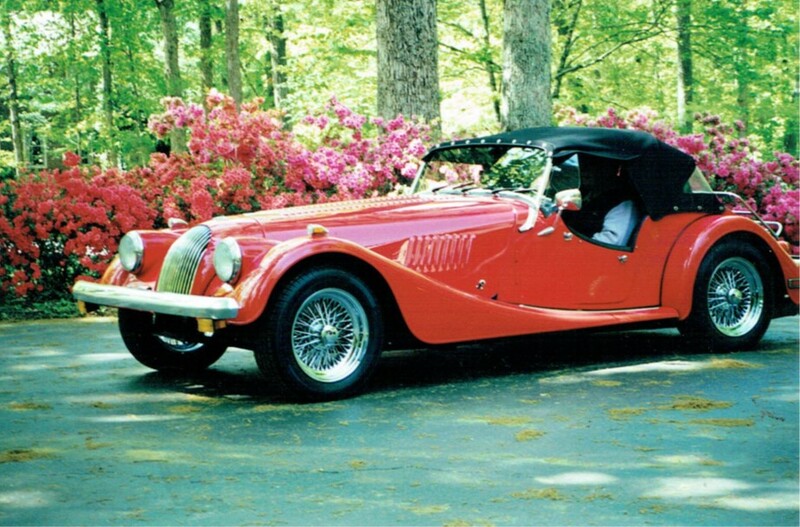 Please call the hotel directly at 910-255-0300 for reservations and request the Morgan Car Club rate. Be sure to make your reservations before August 13th, 2019. After this date they will release the rooms for general sale. We have organized a full weekend of events starting on Friday evening with a Concert on the Green featuring Band of Oz, a very popular band based in North Carolina. We have a meeting room available for our Noggin on Friday evening. Information will be available when you check into the hotel on Friday. The driving tour will continue through the area and include a light lunch spot. After lunch we will return to Pinehurst to take a tour of Sports Leicht Restorations, an award winning restoration specialist close to our hotel. For those who would rather relax on Saturday we also have arranged a leisurely walking tour of the Village of Pinehurst with our Village Historian. Relax and shop the specialty shops and restaurants in this charming village. Saturday evening will be our group dinner at the Ironwood Restaurant. Shuttle service will be available from the Homewood Suites. Shuttles will leave the hotel front desk area at 6:00 PM and 6:30 PM to accommodate everyone. Local maps of the area will be provided for those choosing to drive themselves to the restaurant. A cash bar will be open while we gather for our 7:00 dinner. Dinner will be your choice of the following menu items. Finally, we have planned a pretty full schedule but some of you may want to extend your visit to play golf on one of the famous Pinehurst courses. For particulars you should email Jack Zimmerman at jzimme10@gmail.com. How do you say ‘MOGSouth Noggin’ in Italian?? Actually, it does translate! ‘boccaletta’ ! The weekend was grand! Top down the entire time! I did flop the top up on the car up at night but never really secured it. It was just to give the storm cover some support. I don’t even think Allan and Mary Ann Rae, who traveled with us from central Florida, did even that much. There weren’t any storms or even strong winds. The weather was glorious! A little cool when the sun went down, but otherwise spectacular. Certainly different from past years in Amelia. This one was a bit special. The announcements from Geneva this year were certainly thought provoking. 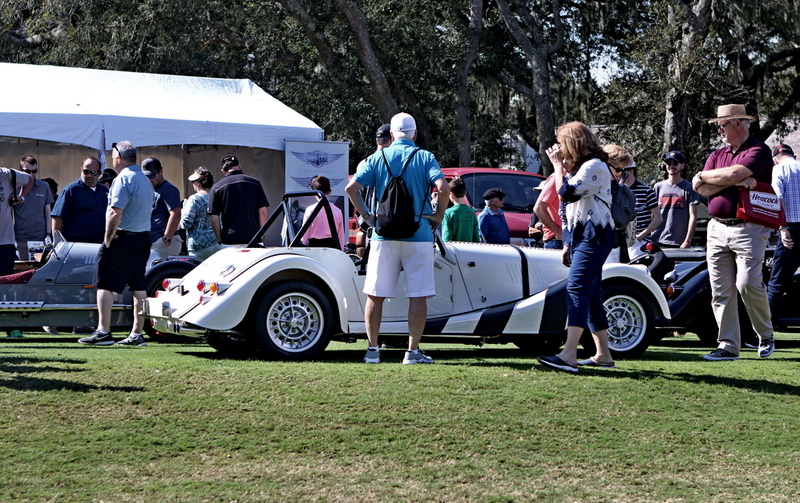 Also, we had the MMC factory folks and many of the US Morgan dealers in town for a ‘big’ dealer meeting. I invited a good number to the Friday evening Noggin and many came. It was great for the MOGSouth members at the Noggin to chit chat with folks they know and love. Well, ok perhaps ‘love’ is a bit strong, but . . .
Andrea and I, along with Allan and Mary Ann Rae, traveled up on Friday morning in the Roadsters. It was really a sprint up the highway. Amelia Island is not too far north of Jacksonville, Florida, so a pleasant enough drive for us. About 3.5 hours. We chose this year to stay in Jacksonville and drive back and forth along the St Johns river, as needed. This was necessitated by the limited hotels on the Island itself. You really have to anticipate and book a hotel room some 6 – 9 months out. And, then you have to save your Nickles and Dimes to pay for the room and be willing to accept the minimum number of nights demanded. 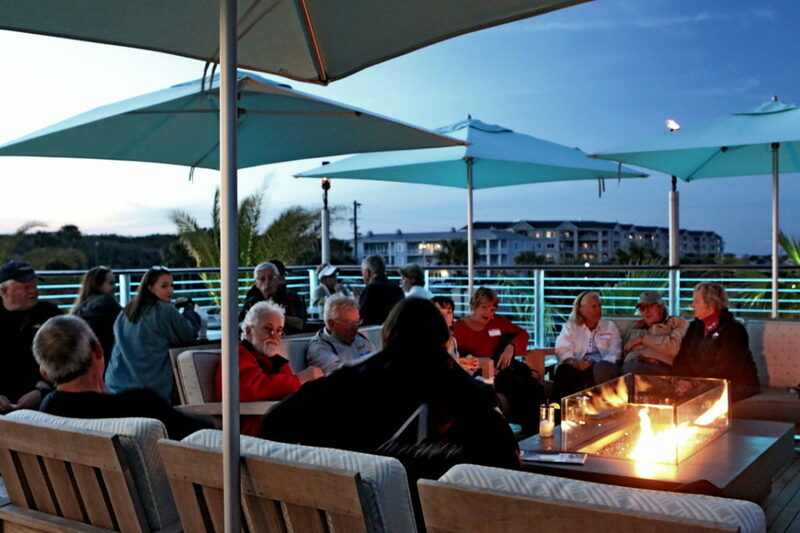 The Amelia Island inn keepers tend raise the rates quite high for the big Concours weekend. Alas, supply and demand . . .
Once we tucked our bags and such into our rooms in Jacksonville, we headed back out to the cars and meandered our way up to Fernandina Beach for lunch. The drive along the river during the day has a different feel than the drive at dawn, but it is still quite pretty, nonetheless. Lots of twisty bits, lots of water and lots of folks fishing off the bridges. You could tell it was Concours weekend as 90% of the oncoming traffic was something noisy and interesting. Porsches, Ferraris, a Deux Chevaux? and others. Very neat! This was only our first taste of the parking challenge . . . The restaurant manager, Tina, had us set up in a roof top ‘lounge’ complete with propane heaters, couches and overstuffed chairs. It even had a fire pit. Not too bad a spot for us, albeit a bit chilly when the sun went down. The view of the ocean was stunning! Taking on a big group like ours is always difficult. 30+ folks are always in need of something, whether it’s food or drink, so the staff was constantly jumping to keep us all satisfied. And, I have to be somewhat appreciative of their efforts as this restaurant doesn’t take reservations but did reserve this ‘prime’ spot for us! A very good turn-out! Lots of MOGSouth folks attended. Some we hadn’t seen in quite a while. 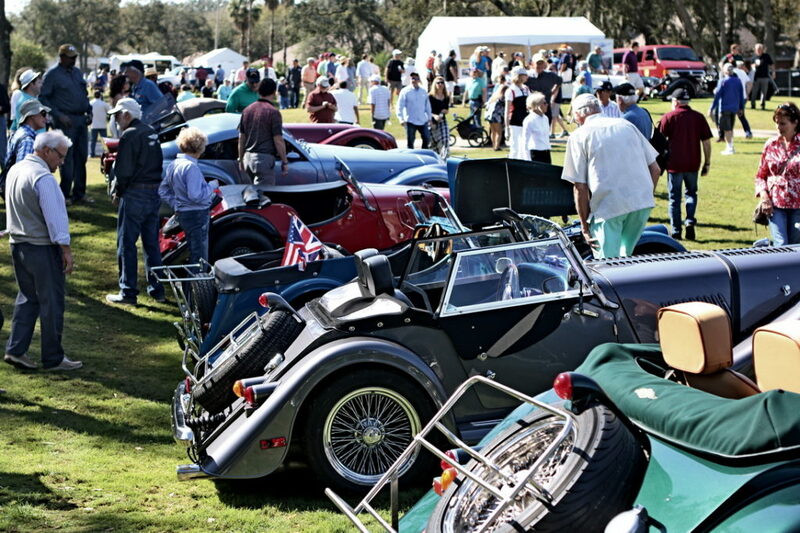 We also had a good number of the US Morgan dealers at the Noggin. We talked mostly about nonsensical stuff, all-the-while trying to eek out some tidbits of information or get some sense of their feelings about the big Geneva announcements and the forthcoming dealer meeting. I didn’t get any earth shattering nuggets but did sense a feeling of ‘concerned’ optimism. Other comments about the component cars, future business outlooks, the very different and misunderstood American market, etc., seemed to flow freely. Then we had to head back to the hotel. The drive in the dark was uneventful. We got the cars home safely and tucked them in. Prime parking spots right out front next to the hotel portico. Diamond Members (I think not!). Then up to bed with an early rise in the morning. The convoy back to Fernandina Beach was to start at 6:30 AM. Yikes! The drive from Jacksonville to Amelia Island, along the St Johns River, at the crack of dawn is truely amazing! The sun coming up over the horizon, peeking through the swamp grass and the masts of the boats in the marinas is very special. Getting up early to make the drive, however, is not so special. This year we had the two Roadsters, ours and the Rae’s, and Harry Gambill’s Aeromax with Rick Fraser’s Aero Eight in our convoy. 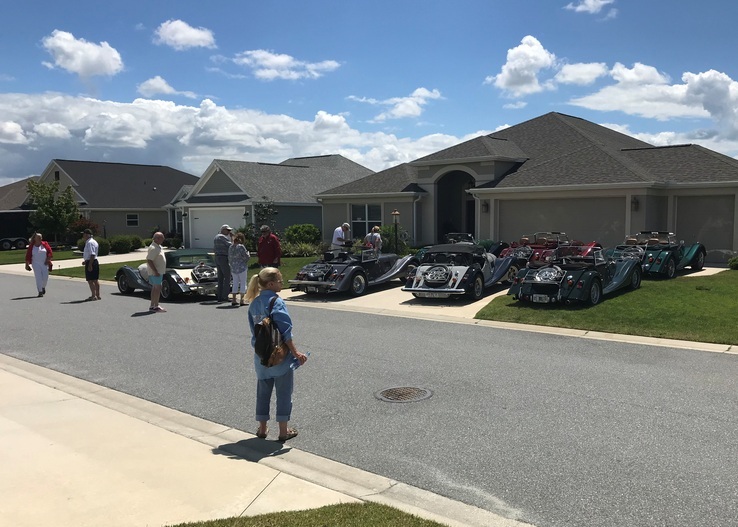 As we have done in past, we all met at a convenient diner, and then convoyed down the road, into the cars and coffee display area, as a single gaggle of Morgans. Typically, if you don’t come in as a group, the organizers will just park you wherever they have space. This year was different. With the Morgan factory folks and the Morgan dealers having a new car display, they wanted the Morgans to park in a specific location on the field, just adjacent to the new car display and tent. As usual, the Morgans were a big hit. Lots and lots of interested folks and lots of questions. We had a very good display with almost all model variants represented. Roadsters, Plus 8s (early and late), Plus 4s (Larry Erd was there with his freshly restored SuperSports clone, still not totally sorted), a Four Seater, the Aeromax, the Aero 8, M3Ws, and Austin Britton’s early 4/4. And, when folks asked about availability, we pointed to the new car tent. It was all good. There were also a number of MOGSouth members, or other Morgan owners there without cars or supporting some other marque, who came by to say hello. Tony McLaughlin of Morganville fame, Jon Scott from Charleston, Charlie and Beth Miller, Stu Mosbey was there with his Porsche(? ), Ray Morgan was running around the Ritz, getting ready to show a car on Sunday, and Ian Levitt from Nashville all came by. Again, I tried to get some information out of the MMC folks and Morgan dealers. I spoke to the two factory employees (Mark and Mike?) for a few minutes and I spoke to six Morgan dealers. Again, I came up empty. Nothing, nada, zilch . . . I really wish I could report on some momentous tidbit of information, but I never got any. And, my attempts to get feedback from the dealers following the afternoon’s big meeting have also failed. I suspect the dealers are all confused somewhere, hunkering down under the ‘cone of silence’. . . Following the show, a dozen of us or so ventured downtown to find a late lunch. The traffic leaving the Cars and Coffee was nuts, every intersection was backed up, so a short-cut through a neighborhood freed us from our confines. We found the restaurant but, again, were challenged to find a spot for the car. Around the block a few times, then a couple guys, car enthusiasts I guess, found me a spot. It wasn’t optimal but it was a spot. I had to go the wrong way down a one way street and then back into the spot. It was a bit chaotic getting in, it was tight and I hit the curb a few times, but I had a parking spot, and an official one at that. And, it wasn’t all that far from the Restaurant. Score!! After lunch, we drove back to the hotel. Tired and ready for a nap. We had the hotel booked for another night so no need to hurry home. We drove back along the St Johns one last time and parked out front once again. We found dinner in the adjacent sports bar. Nothing fancy just a salad bar, a ‘pork’ chop and a ‘belly-up gold fish’? Breakfast at the hotel Sunday morning was abandoned in hopes of something better. I think we found it. Then it was time and we reluctantly headed south down I-95 for home. It was a lovely weekend. Lots of cars, plenty of sunshine, good company and nothing broke!! Can’t ask for much more!